Minecraft developers Mojang have just released a brand new strategy game with barely any fanfare and zero warning. Since you’re here, why not take a look at our list of the best Minecraft seeds. 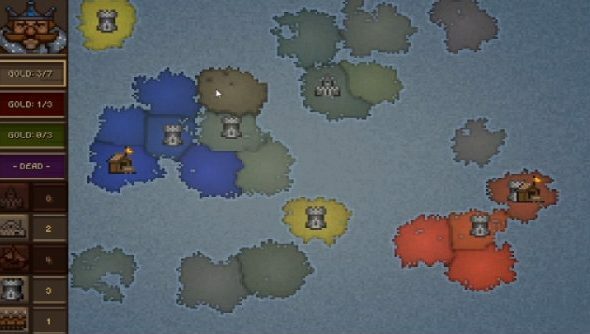 Crown and Council, as the new strategy game is called, was originally created for a game jam and features 75 maps built-in and a map maker so you can create your own. According to Mojang, Crown and Council is “a fast-paced strategy game about conquering land and obliterating rival monarchs. Click adjacent land tiles to subdue them with your army, earning gold to fund further expeditions, defensive forts, naval attacks, universities and more. Each turn begins with you granted gold based on how much territory you control, and it’s up to you to use those resources as efficiently as possible: hoarding for a late game surprise, getting in a early assault, or building up your defenses. There’s no multiplayer at the moment though, which feels like a bit of a missed opportunity. Who knows, maybe they’ll add it in and suddenly spring it on us. Crown and Council is free on Steam.